In my production studio, I save significant amounts of money every year by resharpening my bandsaw blades using my 'on the bandsaw' sharpening protocol. Typically I obtain a few days out of a new band and resharpen it 8-10 times before it is laid to rest. The best resharpened cutting performance is achieved with the second to the fifth resharpenings, and the sixth and later sharpenings are very dependent on the accuracy of the earlier resharpenings. The cutting performance will degrade slightly with each resharpening, but the resharpened band will still cut easily through the wood, if the resharpening was done correctly. If you are an occasional or hobby turner who is cutting clean wood you will no doubt get a few months or more out of your band. If you are using your bandsaw in a production environment - resawing, making bowl blanks, turning squares and cutting through lots of bark and buried 'goodies' typically found in yard wood - like bullets, rocks, wire fencing etc - you will no doubt see shorter life in your blades. 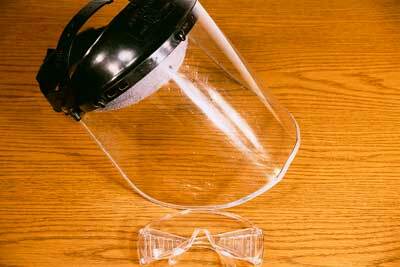 My resharpening protocol is quite simple and does not require much time or effort. Most of us just replace the blades when they become dull. However, in a production environment, the frequent replacement of blades can be expensive. When I first started turning full time, I soon learned that I could dull a bandsaw blade very quickly, in a matter of hours, or even minutes. Cutting wet timber and species with a high silica content - especially with the bark still attached - dulls the band in short order. I looked at having the blades resharpened professionally, but the cost was nearly the same as a replacement band and required driving 45 miles one way. So I began to investigate ways to resharpen the blades myself. Every way I discovered required too much time, effort or money. Most of the sharpening shops just laughed when I said I wanted to resharpen the band... on the saw! I think one guy is still laughing and rolling around on the floor. There is not too much room to work under the bandsaw guides and I wanted something that was quick, small, lightweight and reasonably accurate. After crashing and burning with the sharpening shops, I had just about given up. A few days later, I lucked into several truckloads of ash, pecan-crete and elm. However, I had only one band left that was still sharp and I knew it would not last long with pecan-crete. Yes, I could have just bought some new blades, but being born in the Year of the Rat made me want to stretch a little more life out 'em. I poured over every tool I had in the shop, looking for ideas to sharpen the band. Moto tool! Its small size and lightweight, high rpm motor was just what I was looking for. At first I tried to use the flat abrasive stones, which worked, but did not last very long. Then, I tried the thin, abrasive cut-off wheels and my problems were solved! They are quite durable and maintain their flat face well after repeated resharpenings on the blades. 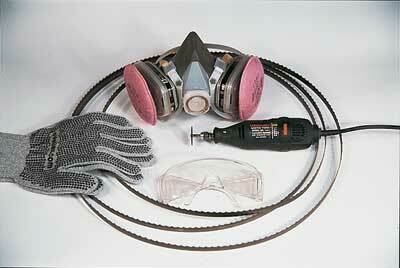 First, unplug the saw and put on a full-face safety shield and an appropriate respirator to handle any of the metal dust that is generated. Then, set up a 100 watt light that illuminates the bandsaw band clearly - I sit on an adjustable-height stool that allows me to have my eyes in line with the cutting zone. 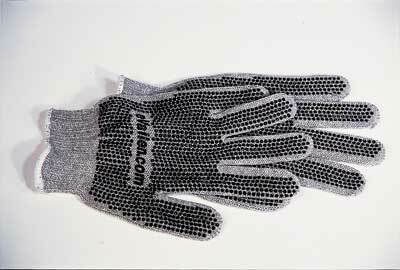 Next, and wearing gloves, fully rotate the band and check for cracks, or other damage. If anything shows up, throw the band out. For safety reasons I only resharpen blades that are free of defects - some chaps weld broken blades, but I do not care to. 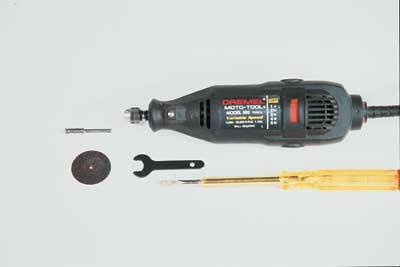 Next, mount a thin abrasive cut-off disc onto the appropriate mandrel and chuck it into the Moto-tool collet. 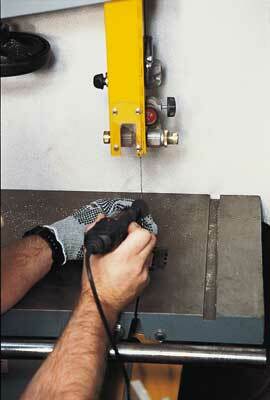 Resharpen the band on the saw, with the tension set just enough to keep the band straight, while you rotate it. With your left hand, advance the band by hand as each tooth is resharpened - or vice versa if you are left handed. 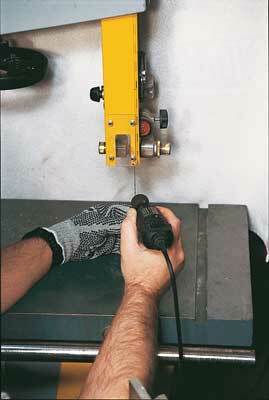 Use your right hand to hold and control the Moto tool, which is set to the lowest speed (10,000rpm). As each tooth is resharpened, rotate the band a bit to bring the next tooth into position. 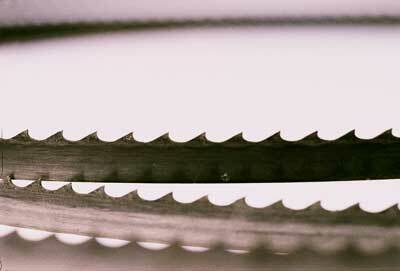 The teeth on the blades are set in a particular way, depending on the type of band and its intended usage. Some teeth are straight in line with the body of the band, others curve right or left. As you resharpen the teeth, rotate the end (flat face) of the abrasive disc, so it matches the direction and curvature of the tooth. Touch the flat part of the wheel lightly to the top of each tooth, making sure the contact sharpens all the way to the end of the tooth. Repeat the process for each tooth, making sure that the wheel contacts and follows the top of the tooth correctly - this is very important. 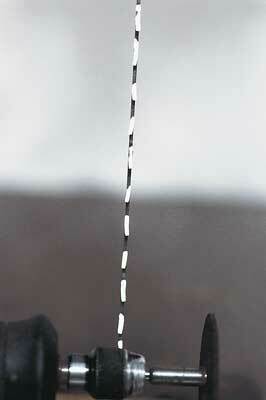 You want the resharpened surface to feather into the shape of the tooth. Note: I only sharpen the top of each tooth, making sure to keep the direction of each tooth in mind while sharpening it. This means you must turn your wrist to accommodate each individual tooth-setting angle. The process sounds more complicated than it is, but if you follow this rule, the band will stay sharp longer and give more even and accurate cuts, very near the original factory sharpening. I should mention that I use this resharpening protocol primarily with 3tpi blades. Since the resharpening process creates a bright polished top on the tooth, it is easy to tell where you started and thus, where you need to stop. My blades are 6in (150mm) long on my 460mm (18in) bandsaw, and it takes me less than five minutes to complete the process on a 3tpi band. Obviously, my resharpened blades are not as good as new, or even professionally resharpened, blades. However, they are sharp afterwards and allow me to continue cutting with a minimum of downtime and expense. I can usually achieve about 8-10 resharpenings per band, although on occasion, I have had as little as six. Use a very light touch on each tooth - it takes only a whisper of a touch to resharpen the edge. 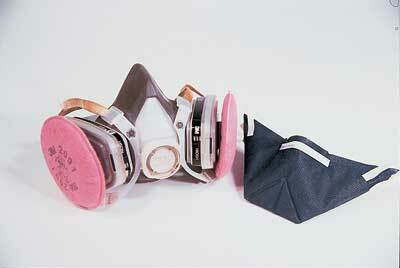 Replace the abrasive disc after it has been used 8-10 times. It does take practice to get good at this - what in turning does not? - but when you've got the knack it can save you a lot of time and money. "When you have got the knack it can save you a lot of time and money"
Although my original sharpening protocol uses abrasive cut-off discs in the Dremel tool, you can also use small diamond discs to sharpen the blades. 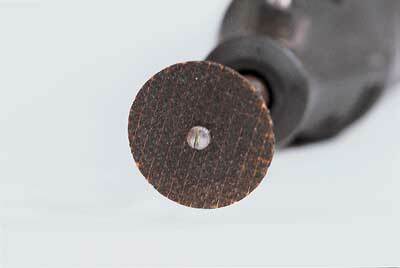 These produce a higher-quality sharpened surface because you have more choice over the abrasive grit range. For a more thorough sharpening, you can sharpen the entire tooth instead of just the top portion. This requires two separate operations. To sharpen the entire tooth, a supplemental sharpening protocol and abrasive attachment is required. 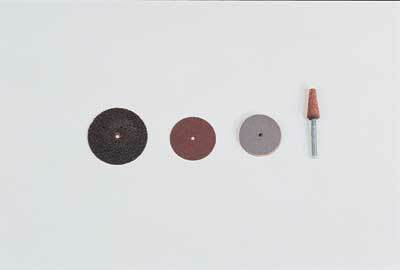 Round abrasive or diamond stones, see diamond discs panel, can be used to sharpen the underside of each tooth. Long thin stones that are very close to the gullet size of the underside of each tooth work best. The underside of each tooth is sharpened in much the same way as the top portion, using a very light touch. Gently raise the stone under each tooth to sharpen the underside area of each tooth. If you have the capability to reduce your rotary tool to 5,000rpm, a slower speed will make the tool and the stone easier to control, especially when sharpening the underside portion of the tooth. When sharpening the underside take care to keep good control of the tool. The rotation of the stone coupled with the curvature of the underside of the tooth can make the stone 'race' along the curvature of the tooth. Use a firm grip to control the movement of the stone under the tooth. This is easier than it sounds, but does require a bit of extra care. 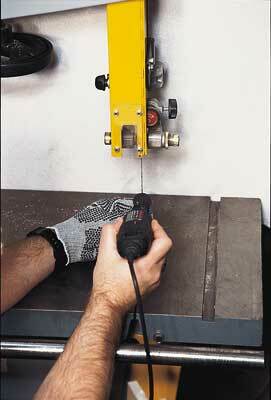 Do not use resharpened blades to make any critical cuts. You cannot duplicate a professional sharpening by this method, but it works well for rough cuts and non-critical cutting - gross resaw work and corner removal on bowl blanks, etc.